This romantic beachfront hotel is nothing short of ideal for your honeymoon vacation. Offering luxurious and private accommodation and a plethora of amenities to enjoy along with your significant other, this hotel is bound to offer you the most romantic trip of your life. A luxury 5 star hotel which features a selection of flawless accommodation to suit families, couples and individuals. The wonderful accommodation choices, the breathtaking sea view, the various dining options, the relaxing spa therapies along with the fun sports activities and water sports ensure an unforgettable experience for all guests at this luxury hotel. 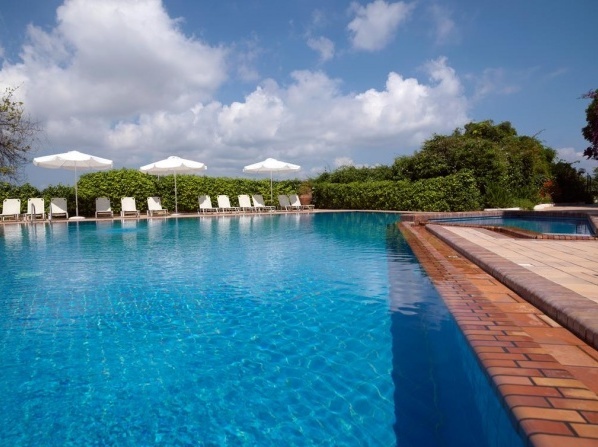 A Hotel-Bungalow complex situated just 6 kms away from Corfu Town, the island’s capital. Unrivaled service, gracious amenities and stunning views of the Ionian Sea. 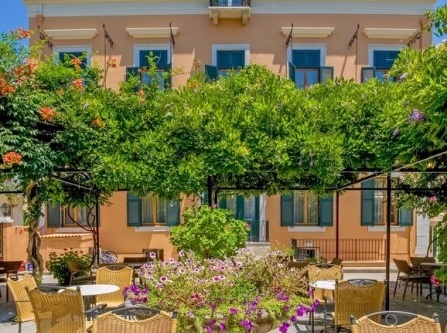 Overlooking the Ionian Sea and the Venetian Fortress of the city of Corfu, the historic Mayor Mon Repos Palace combines elegance with luxury and classical with modern. Luxurious and private accommodation, rejuvenating spa facilities, breathtaking nature and culture and exquisite gastronomic delicacies are just some of the special amenities that you and your loved one will indulge in once you choose this hotel to spend your honeymoon. The hotel is available for guests above 18 years old, children are not permitted. 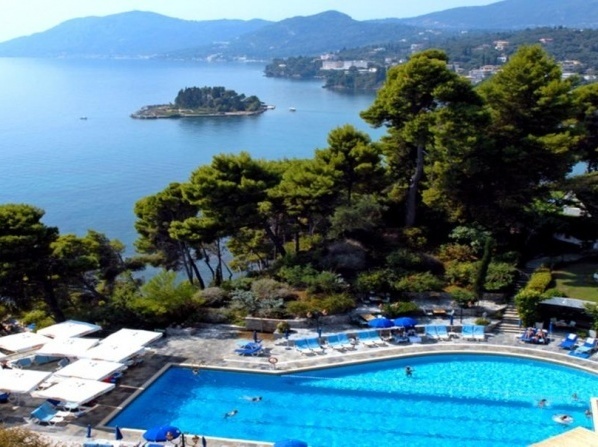 Its unique location, relaxing atmosphere and friendly service have established this hotel as one of the most popular holiday choices of Corfu. A 4-star luxury hotel, built on a peninsula in Paleokastritsa, featuring two pools, a tennis court and private balconies overlooking the Ionian Sea. On the west side of the hotel, Agia Triada beach is an organized public beach in which the guests can have immediate access through the lift and a few steps. Offering an outdoor pool, a kids' pool and a wellness center, the hotel is located in the center of Dassia, only 100 m from the beach. 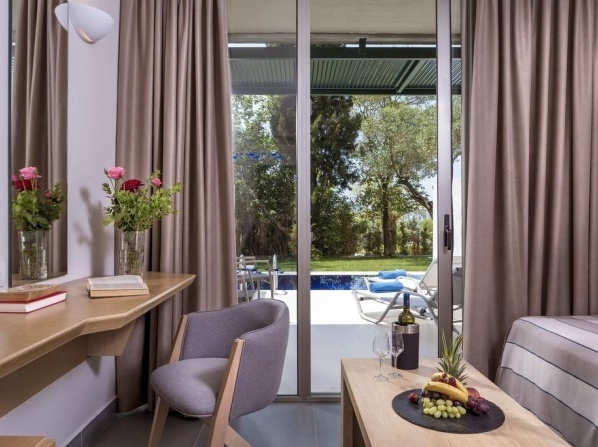 This modern boutique hotel is a wonderful honeymoon destination and it offers a luxurious exclusive suite perfect for couples celebrating their love, with stunning views over the swimming pool and the natural green landscape of Corfu. A beautiful stone-built house which was very lovingly refurbished into a luxury private retreat with authenticity being its main attribute. 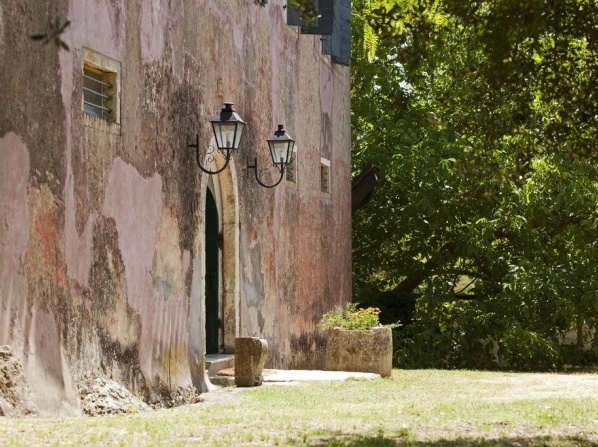 Surrounded by lush greenery, this luxury hotel consists of three 18th century restored buildings, featuring an outdoor pool snack bar and a tennis court. 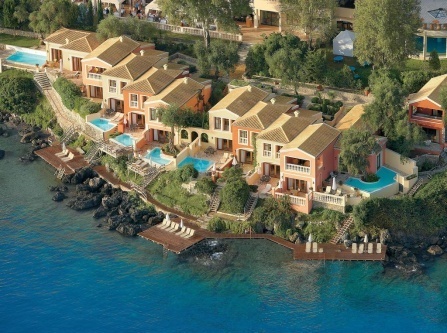 Overlooking the sea and the famous Pontikonissi, the resort is close to Corfu's town centre. This exquisitely romantic resort offers villas, bungalows or suite accommodation which couples can choose to spend their honeymoon in. Pamper yourself and your loved one and spend the most luxurious honeymoon trip at this 5-star hotel. 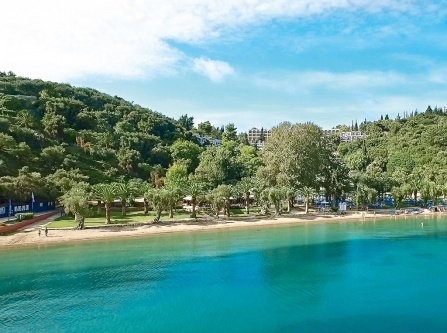 A 5-star Corfu hotel with a direct view to the monastery of Mary of Vlachernes and Pontikonisi. 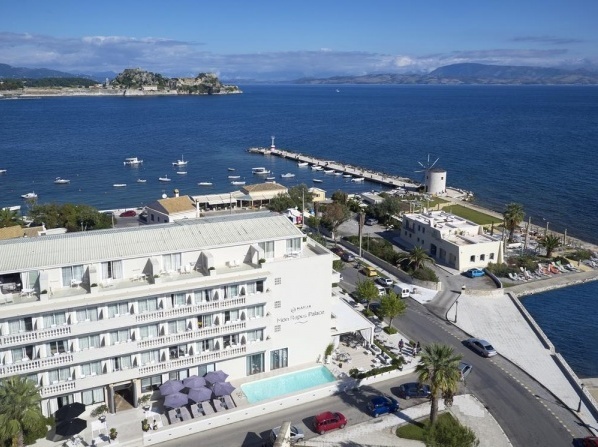 The impressive hotel is located at one of the most beautiful points of the island overlooking the Garitsa Bay, just 400 m from the centre of Corfu Town. 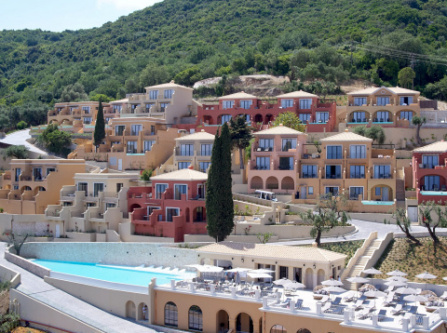 Situated in the heart of Corfu Island, 5’ from the well known Liston, this luxury resort operates all year round. Οnline reservation and facilities for this 5 star deluxe hotel which features 115 rooms and suites in Corfu town. With the hotel name Nido deriving from Italian meaning ‘nest’, the hotel reflects this in its warmth and intimate environment. Echoing Corfu’s natural charm, guests are truly made to feel at home during their stay at MarBella Nido Suite Hotel & Villas. 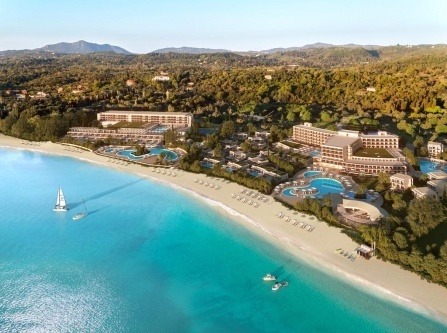 MarBella Nido Suite Hotel & Villas is an adults-only hotel, situated adjacent to MarBella Corfu overlooking the blue flag beach of Agios Ioannis Peristeron and guests will have access, if desired to the facilities at MarBella Corfu including the restaurants, bars and spa. Guests at MarBella Nido Suite Hotel & Villas will have their own spa and access to the spa facilities at MarBella Corfu, if desired. A relaxing escape with natural branded products awaits all guests at MarBella Corfu with the delightful menu of spa therapies and treatments available. My spa offers: treatment rooms for a wide array of massage and pampering beauty spa care treatments using beauty products of Apivita. Manicure, pedicure and coiffure services. This hotel is available for adults only, children cannot be accommodated. Located amongst Kassiopi’s olive groves, the family-run hotel is ideal for a relaxing holiday in a peaceful setting. One of the island’s premier hotels, offering impeccable, personalized service and fine amenities. The hotel features 30 rooms and one suite, all with private bathrooms, direct telephone and free internet access, flat screen TV, safe, air conditioning, mini fridge and state of the art orthopedic beds with double mattresses and exquisite linens and duvets. Two beautiful rooms designed with honeymooners in mind and a second floor grand master suite with a panoramic view of the town, ideal for families, round out the accommodation. The hotel is housed in a gloriously restored neo-classical mansion. The hotel offers a Romantic Corfu package for couples on romantic or honeymoon trips, which includes luxurious accommodation, a complimentary bottle of wine and a bouquet of roses to enhance the romantic atmosphere. Aristocratic palazzos & villas which share the comfort and the mood of a seaside country home; private havens that float above the Ionian Sea. Experience the most luxurious and romantic honeymoon at this 5-star resort. Offering 4 distinctive honeymoon packages for guests to choose which one suits their needs best, the hotel offers luxurious and private accommodation with stunning sea views to all couples and ensures an absolutely romantic and memorable stay. 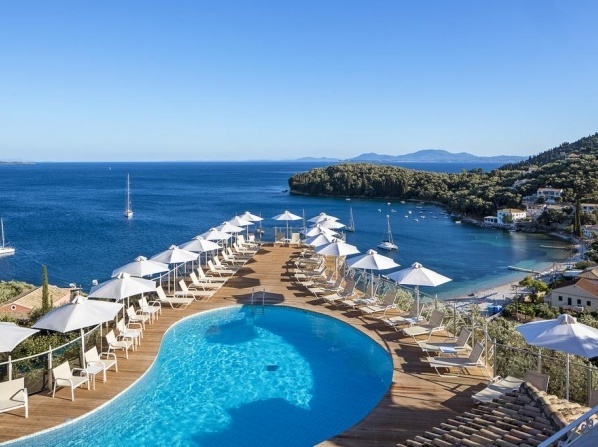 Standing on a private peninsula with scenic views of the Ionian Sea, this 5-star resort boasts a large outdoor pool and 3 private sandy beaches. 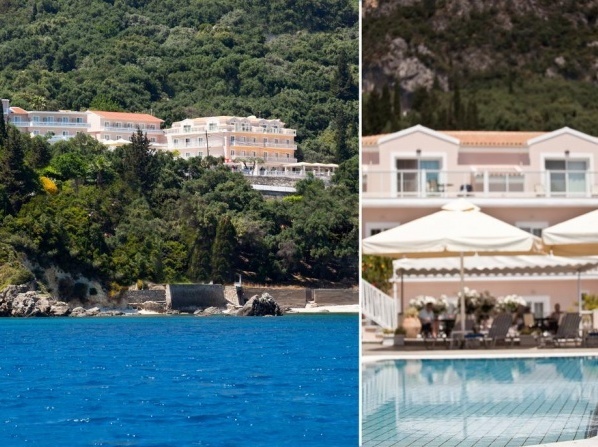 Featuring 2 freshwater pools amidst its blossomed gardens, the hotel literally tumbles down the green hillside with a unique view of Dassia Bay in Corfu. This is a modern 4 star luxury hotel, located on the wooded hillside of Kanoni, overlooking the pristine waters. 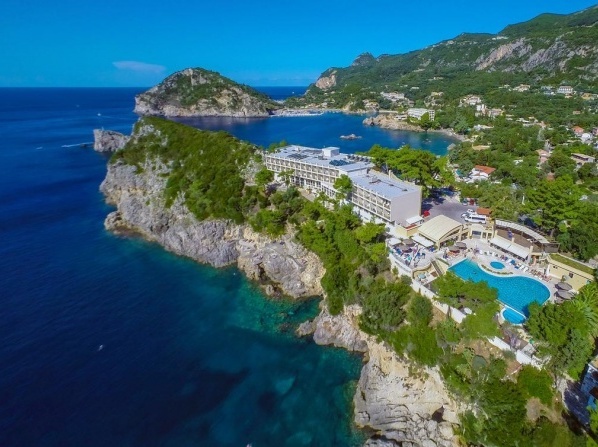 Spend your honeymoon at the beautiful island of Corfu, in your very own suite at this 4-star hotel, which offers stunning views and exquisite accommodation and services. Set at the base of a hill, this luxury boutique hotel offers magnificent views to the sea, bright accommodations with luxury furnishings and thoughtful amenities. Overlooking Eva Palace’s beaches and tropical grounds, all rooms exude an aura of romance and enchantment. Overlooking Eva Palace’s tropical beaches and grounds, all rooms of this luxury hotel exude an aura of romance and enchantment. Unique moments of romance and relaxation wait for you and your loved one at this hotel. Offering luxurious accommodation and honeymoon packages to benefit from, you can create your own dream-like honeymoon right away. 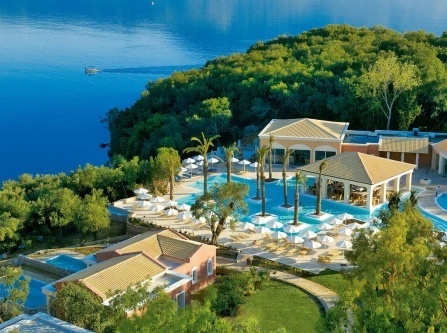 A 5 star resort which offers luxury accommodation in Corfu, ideal for luxury vacation, weddings and couples.